Is your home a smart home? If you’re like most U.S. homeowners, the answer is probably yes, or it will be soon. What were once seen only as gimmicks reserved for the tech-savvy homeowners have quickly become the norm. We conducted a survey and found that almost half (45%) of Americans own some sort of smart home technology. More surprisingly, 36% of that group don’t consider themselves to be early adopters of technology. 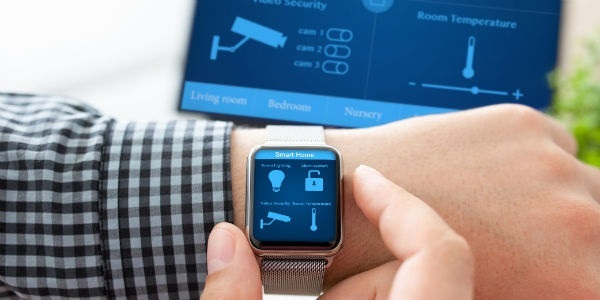 Whether you’re shopping for a first home, looking to sell your home, or planning home renovations to add value to your house, smart home technology should be at the top of your must-haves list. 54% of homeowners said they would install smart home products if they were selling their home and knew that doing so would make it sell faster. In fact, about 33% of agents said homes with smart features sell faster. What Makes a Smart Home Smart? One of the fastest-growing smart home features in the last year is voice control. The list of products that operate with voice control features is growing by the day, from music players to TVs to even security products, lighting, and shopping. Most Americans think a home can be considered “smart” when it has smart security locks and alarm systems. Security features lead the way for smart features in terms of adoption and appeal. Even though 58% of home buyers say smart security is the most appealing type of pre-installed smart home technology, only 31% have smart security installed. The safety of the household should be a top priority for any homeowner. Smart technology offers new features for fire and carbon monoxide detectors, nightlights, and other renovations to make your house safer. Homeowners look for safety features that allow them to monitor and control the safety of their home either when they are away (52%), or from anywhere inside the home (30%). The leader in smart thermostats, Nest, has also released a smart Smoke and CO Alarm, Nest Protect. One feature of this device that is quickly becoming the norm for smart technology is interconnectivity. If your Nest Protect detects smoke or carbon monoxide, it will tell your Nest Thermostat to turn off the furnace automatically. C by GE uses Bluetooth connectivity so you can personalize your light temperature settings throughout the day. This allows your lighting to sync with your body’s circadian rhythm and improve your sleep cycle. FlipFlic is a device installed on window blinds that automatically adjusts the blinds based on light, temperature and time of day. Natural lighting can play a major part in your home’s mood and vibe and this device gives you more control over it. Our study also found that 70% of homeowners say they plan to invest more money in smart home renovations and features in the future. This new home trend is rapidly increasing and offering homeowners new ways to improve their own standard of living while raising the value of their homes. Which smart renovations and features do you plan on adding to your home in 2017?